Cigarette tar is a term used to describe the toxic chemical particles left behind by burning tobacco. This substance forms a tacky brown or yellow residue. It is not the same as tar used on road surfaces. Tobacco is best known for three major dangers: nicotine, tar, and carbon monoxide. Nicotine is the chemical that causes addiction but it is the tar that is responsible for the biggest health risks, including many types of cancer. According to the National Cancer Institute, tobacco smoke contains over 7,000 chemicals. The majority are found in the tar produced by smoking cigarettes. Two hundred fifty of those chemicals—including carbon monoxide, ammonia, and hydrogen cyanide—are known to be harmful to smokers and people exposed to secondhand smoke. Of those, 69 are known to cause cancer. The tar in cigarette smoke builds up inside the lungs as it is inhaled. Over time, a healthy pink lung turns grey and eventually becomes black as more tar accumulates. The primary effect is that the tar paralyzes and can eventually kill cilia in the lungs. Cilia are tiny, hair-like projections that line the trachea. They help trap pollutants, but when they're disabled, the toxins in tar can travel deeper into the lungs. Some of these toxins are released when you exhale or are coughed back out, but some settle and stay in the lungs, where they can cause damage. The tar does not just affect your lungs, though. From there, the toxins can be carried into the bloodstream and begin moving to other parts of your body. They can affect every organ in your body and beyond cancer, can lead to heart disease, diabetes, and even affect fertility. The most visible sign of tobacco tar is the yellow-brown staining on smoker's fingers and teeth. Because smoke is drawn directly through the mouth, the tar can contribute to gum disease and oral cancer as well. Cigarette filters were first added in the 1950s when it was reported that the tar in tobacco was associated with an increased risk of lung cancer. The idea was for the filter to trap harmful tar and nicotine residues, but the design never worked as well as hoped. Plenty of toxins still made it through and into the smoker's lungs, exposing them to the risks of smoking-related disease. Today, "light," "low," and "mild" descriptors on cigarette labels are no longer allowed in the United States. Cigarettes with a lower level of tar are referred to as "low-yield" cigarettes. This was done so that smokers don't mistakenly think that these cigarette products are healthier than regular cigarettes. 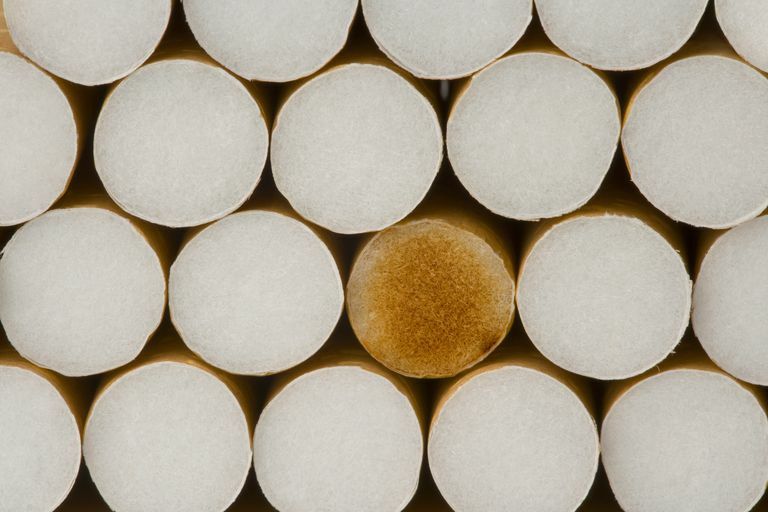 The filters in low-yield cigarettes also have more air holes than typical filters. This does not seem to do much good because many smokers inadvertently cover them up when holding a cigarette. According to the Centers for Disease Control and Prevention (CDC), research has shown that the risk level for lung cancer in smokers is virtually the same regardless of whether regular or low-yield cigarettes are smoked. Quite often, smokers will inhale more deeply and smoke more low-yield cigarettes to obtain the same amount of nicotine found in regular cigarettes. Additionally, current smokers face a greater risk of lung cancer than people who have never smoked or smokers who have quit, regardless of the tar level in their cigarettes. Over the years, there has been a lot of talk about secondhand smoke. Being in an environment with smokers has been proven to lead to a number of diseases and even a cause of strokes in some non-smokers. That is not the only harm, though. Scientists have identified additional risks associated with cigarette residue that lingers in closed environments where cigarettes, cigars, pipes, and rolling tobacco have been smoked. This health threat is called thirdhand smoke. Cigarette tar and thirdhand smoke contain many of the same chemicals. It is now understood that the brown, tacky toxins left behind from smoke drawn through cigarette filters also settles on surfaces and stays put. In addition to the resins that make up cigarette tar, thirdhand smoke also includes airborne chemicals that remain in the air for a period of time after a cigarette has been smoked. Thirdhand smoke is dangerous for everyone who comes in contact with it. It is especially harmful to small children who may touch tainted surfaces and then put fingers into their mouths. Tar is present in any tobacco product that is burned. The level of tar increases as the item is burnt down. The last puffs on a cigarette can contain as much as twice the amount of tar as the first puffs. Tar in cigarette smoke paralyzes the cilia in the lungs and contributes to lung diseases such as emphysema, chronic bronchitis, and lung cancer. The concentration of tar in a cigarette determines its rating. High-tar cigarettes (regular or full-flavor) contained 15 milligrams (mg) or more of tar. Medium-tar (light) cigarettes had 6 to 15 mg, and low-tar (extra-light or ultra-light) cigarettes contained 1 to 6 mg of tar. The average amount of tar in cigarettes was lowered from 38 mg (and 2.7 mg nicotine) in 1954 to 12 mg of tar and 0.95 mg of nicotine. It remains at that level today. Cigarette tar is poisonous and carcinogenic and is present wherever there is tobacco smoke. The best way to remove this danger from your life and those you love is to avoid indoor locations (including cars) where cigarettes are smoked. If you are a smoker yourself, consider quitting. When you're ready, there are a variety of resources available to help you on the journey. Centers for Disease Control and Prevention. Low-Yield Cigarettes. 2017. Matt GE, et al. When Smokers Quit: Exposure to Nicotine and Carcinogens Persists From Thirdhand Smoke Pollution. Tobacco Control. 2016;26(5):548–556. doi: http://dx.doi.org/10.1136/tobaccocontrol-2016-053119. National Cancer Institute. Tobacco Tar. 2018. National Cancer Institute. Harms of Cigarette Smoking and Health Benefits of Quitting. 2017.